Alberton is a town situated on the East Rand of Gauteng Province in South Africa which celebrated its centenary year in 2005. As of 2007 it had a population of 202,202. It is known as a typical bedroom community, a community primarily residential in character, with most of its workers commuting to work in nearby suburbs or cities. The town has multiple access roads to all major freeways in Gauteng. 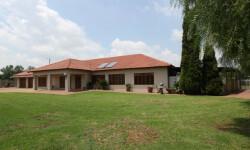 Alberton is situated on the banks of the Natal Spruit close to the major urban centres of Johannesburg, which lies 15 km (9 mi) to the northwest – and Pretoria - which is 76 km (47 mi) to the north. At the age of 13 a boy by the name of Johannes Petrus Meyer bought 11 hectares (27 acres) of his father’s farm Elandsfontein. He later built a house next to the Alberton stream or Natalspruit, close to where the civic centre stands today, and married. After his wife died in 1870 at the birth of their fourth daughter, he decided to start a general store and built his farmhouse mansion in 1890. The house was miraculously left unharmed during the Anglo Boer War of 1899–1902 and can still be seen today from the bypassing N12 freeway. Jan's brother, Johan Georg (Org) Meyer, took over the farm after Jan's death. General Hennie Alberts, a veteran of the war, purchased a part of the farm Elandsfontein from Org and he decided on the name Alberton. The Afrikaans medium primary school Jan Meyer was named for the original owner of the farm, and the affluent suburb Meyersdal also refers to the family whose original farmhouse mansion still stands on the land behind the Meyersdal koppie. The primary school Generaal Alberts, and Hennie Alberts Avenue in the suburb of Brackenhurst, are named after the town founder. The first official post office was opened in 1926, and in 1938 building work started on a town hall. Street names in the Alberton North suburb were renamed after Voortrekkers in 1938, to coincide with the 100 year commemoration of the Great Trek. The well-known Blou Meul was established in 1954 in Van Riebeeck Street, Alberton North, and is still trading today as a general store specializing in outdoor activity equipment. Over the years development sprawled out into adjacent areas, and today Alberton is made up of 19 suburbs: Aarton, Alberante, Albertsdal, Alberton North, Alrode, Brackendowns, Brackenhurst, Eden Park, Florentia, General Alberts Park, Mayberry Park, Meyersdal, New Redruth, Newmarket Park, Palm Ridge, Randhart, Raceview, Roxton, South Crest, South Downs, Thokoza, and Verwoerdpark. Alrode, which is Alberton's current industrial suburb, was established in 1943. Healthcare facilities include numerous government clinics as well the privately run Union Hospital and Clinton Clinic. There are sports facilities and clubs for tennis, rugby, boxing, wrestling, cricket, jukskei, netball, hockey, soccer, bowls, korfball and ring tennis in Alberton. It is also home to the Reading Country Club and Golf Course. Alberton was also home to the now defunct New Market Race Course, which is now a shopping mall. Developed over what used to be the Newmarket Racecourse in Alberton, Mall at Newmarket is conveniently located at the Newmarket Park, a 77.3 hectares (191 acres) property development south east of Alberton's CBD. Alberton enjoys a dry, sunny climate, with the exception of occasional late afternoon downpours in the summer months of October to April. Temperatures in greater Johannesburg are usually fairly mild thanks to the city's high altitude, with the average maximum daytime temperature in January of 26 ℃ (79 ℉), dropping to an average maximum of around 16 ℃ (61 ℉) in June. Winter is the sunniest time of the year, with cool days and cold nights. The temperature occasionally drops to below freezing at night, causing frost. Snow is a rare occurrence, with snowfall having been experienced in May 1956, August 1962, June 1964, September 1981 and August 2006 (light). Regular cold fronts pass over in winter bringing very cold southerly winds but usually clear skies. The annual average rainfall is 713 millimetres (28.1 in), mostly in the summer months. There are infrequent showers in winter. 45 Jacqueline Street, Randhart Alberton, Gauteng 1449. Just Property - Alberton & JHB South Branch Welcomes Ronnie to the winning team!